This summer, the US Federal Communications Commission (FCC) launched an initiative to revisit the previous administration’s “Fair and Open Internet Order,” which established an approach to regulating the Internet commonly called network neutrality. The current FCC hopes to “end the utility-style regulatory approach” of the past administration, which the FCC represents as an aberration in the Internet’s history of increasing freedom and openness, and replace it with a “light-touch regulatory framework.” If undertaken, this move will reclassify the Internet as an information service, rolling back the decade-long struggle that led to the Internet being considered a common carrier. The FCC claims this reclassification will serve as a course correction for Internet regulation, but their proposal is out of step with the Internet’s established history as a common carrier. Common carriage is an old idea with a long and tested regulatory tradition. Simply put, it makes a judgement about the importance of certain infrastructure for the public and sets regulatory conditions to ensure these special services work on behalf of the public good. Railways, telephone lines, and Internets have been vital to society and the economy and are thus common carriers. Given their importance, common carriers enjoy special protection under the law in exchange for facilitating open and neutral communication channels in addition to separating content and carriage. Common carriage is often seen as a relic from the age of telephony. That is a myth. Many who built today’s Internet believed they were building a common carrier. 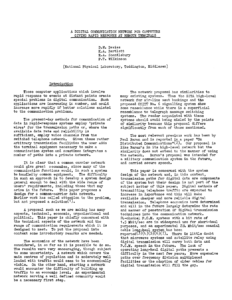 John McCarthy, a seminal figure in computer science, imagined in 1961 that “computation may someday be organized as a public utility” that would be open to everyone who hoped to access the new opportunities provided by digital computing. Even more ambitiously, computing visionary J. C. R. Licklider imagined “libraries of the future” organized around computers. Later, he conceived of new communication networks like ARPANET, the forbearer of the Internet, as the means through which the public could connect to these information resources. Common carriage was a goal for many of the researchers behind the early Internet, and early designs for the Internet—technically a packet-switched communication model—explicitly proposed building the new system as a common carrier. Nowhere is this more clear than in the work of Donald Davies, one of the two “inventors” of packet switching. Working in the United Kingdom, Davies developed his ideas around digital communication while imagining the result would be a common carrier. He thought that this common carrier, very modestly, would give the greatest number of users the most affordable access to take advantage of “future developments in computer and transmission technology.” He proposed the adoption of packet switching because it allowed different applications to share the same infrastructure. Thus, packet switching was designed to be a common carrier for digital communications. The first page of Donald Davies’s proposal for a common carrier. While his proposal for a national digital common carrier run by the post office never took off, late night conversations about the idea at a 1967 conference inspired developers of the ARPANET. The researchers behind this experimental communication network developed by the US government campaigned for it to become a national common carrier, making its benefits available to the broader public. 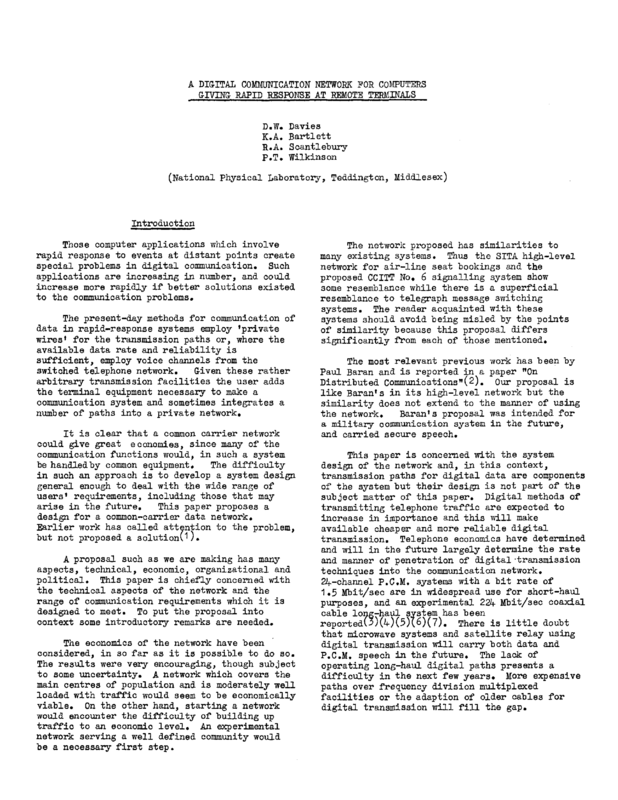 A review of its first ten years, written in 1981, explained that one of the anticipated benefits of the ARPANET would come “by transfer of management of the ARPANET to a common carrier, and the resulting availability of ARPANET services to other groups.” Like their French and, to a lesser extent, Canadian counterparts, the developers of ARPANET believed in the public good of a computer utility. The FCC’s proposed reclassification of the Internet then is really a reallocation—an amplification of the process of taking the public investment and knowledge that led to the Internet today and transferring it completely to private control without strong public accountability. The infrastructures built under the spirit of the open Internet will convert to private, disconnected information services. In thinking about what the Internet should be, the FCC ignores what the Internet has always been. Despite their claims, the FCC’s plan will not put the Internet back on its historical course towards freedom and openness. Instead, it represents a betrayal of the dreams and optimism about computers as a public good that propelled the Internet along that course from the beginning.